Some users want to send detailed report of their work to their customers. Usage report will show all activities recorded while you were working on the timesheet. To get this report, just create a timesheet, then switch to tab "Usage details". 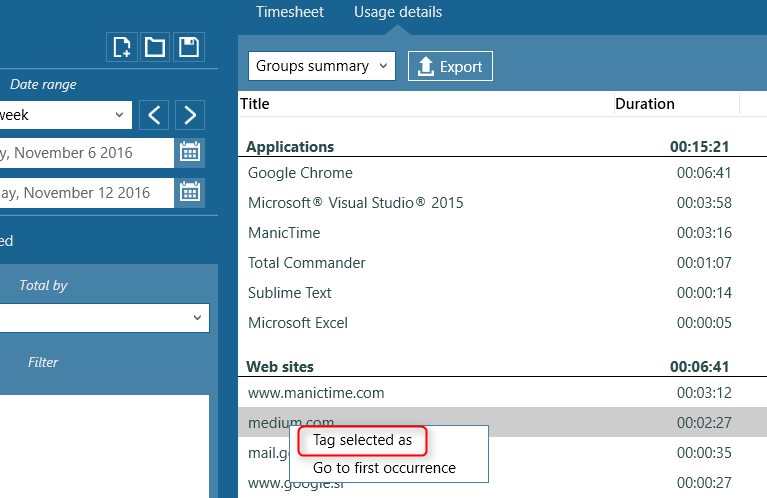 This will create a report, which will include only activities tracked during the time you were working on tags included in the timesheet. You can export all the details or group the report by Groups or Title. Sometimes you will incorrectly tag an entry. For example my medium.com visit below should not be part of the invoice. To remove it from the invoice, all I have to do is right click on the entry and choose "Tag selected as". Then tag it as something else and refresh the report. If you'd like to know when some activity happened, right click on an entry and choose "Go to first occurrence".